Voice Box is a Philadelphia Area Studio for Voice Over Casting, Recording, Voice over Classes & Voice over Demos. 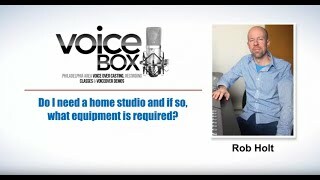 Rob Holt from Voice Box, has been a voice over casting director in the Philadelphia area for over 10 years. Although he has run his share of on-camera auditions, Rob has focused mainly in the area of voice over casting and has helped clients find the right voice for hundreds of projects, ranging from TV and radio commercials to instructional modules, corporate training, medical research, and phone systems. Our goal is to provide a clean and natural sounding reproduction of the vocal performance to best suit your project. Clients can direct in studio or from their location using our phone patch. Rob Holt has taught many VO workshops throughout the years for kids, teens, and adults. He has also given numerous lectures on the subject of voice over for organizations such as the Screen Actors Guild and Backstage Magazine with 50 to 100 attendees. Rob is an instructor in the 8-week voice over class, and the advanced class. The basic component: the microphone. I don’t know if it’s in the shot, but I’m speaking into a microphone. And it’s the part that captures your voice. But there’s also, let’s just say that we’re assuming everyone has a computer, because you will need one if you don’t, but most people do these days. So assuming you have a computer, they make what’s called USB, they make USB microphones these days, where it’s a microphone, a USB cable comes right out of the microphone and right into your laptop or your computer, and you can record directly through your computer’s USB connection. Is it the most versatile and highest quality recording? No, but it’s definitely the simplest and the most cost effective. And I know people who have started out that way and worked their way up eventually once they got money coming in. So you will need a mic, you will need a, I would say a decent set of headphones that are studio monitor headphones because you’re going to want to hear what you’re recording somewhat accurate. If you don’t have, if you’re only using laptop speakers, laptop speaker, they don’t sound good; they’re tiny, they can’t. It’s like your iPhone speaker; it can’t play low frequencies. So if you’re recording your voice over, and it sounds awesome but the air conditioner is going in the other room, and it’s making this low, low rumbly frequency that the mic is picking up, if you’re monitoring on, or if you’re listening back on your computer speakers, you’re never going to hear that and if you send that off to a producer who is listening to your audition in a studio that has subwoofer, it’s going to sound like you’re voice over is from the deck of the Starship Enterprise or something with the low rumble at the background, so a set of at least monitor headphones are essential. You want to think of your monitors as your windshield; you got to see where you are.